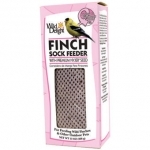 Attract all varieties of finches including Goldfinches, Purple Finches and House Finches. 15 Thistle Tube Feeder portals are designed for feeds with small kernel size like finch mixes and thistle (Nyjer). Feeder has 1.3qt. seed capacity (approximately 1.6lbs.). 2.5 inches in diameter 15 inch tube 6 port nyger (thistle) feeder. Fully assembled. Green. 2.5 inches in diameter 23 inch long tube 8 port niger (thistle) feeder. Sales ready. Fully assembled. Green. A Droll Yankee Classic. 2.5 inches in diameter 16 inch tube 8 armored ports for niger (thistle) seed. 2.5 lb. seed capacity, 4 feed ports, adjusts to serve mixed or NYJER thistle seed, integrated retractable feature to lower feeder for filling, easy fill wide mouth top. 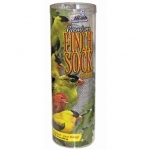 Prefilled Sock 25oz with 100% Nyjer Seed, just hang it without spilling seed. This thistle (Niger) seed tube feeder holds 2 pounds of seed. The feeder has plastic top and wood perches. 2.5 inches in diameter 15 inch tube 6 port niger (thistle) feeder. Sales ready. Fully assembled. Burgundy. This upside-down thistle feeder features a yellow dome water-seal cap to keep seed drier. The 18 inch feeding tube is weather resistant. Birds feed from six upside-down feeding ports with perches. Feeder empties completely leaving no residue. Handy re-usable finch feeder filled with Nyjer seed. Natural Formulas are made from high-quality natural ingredients chosen for their superior nutrient profile. No additives or flavors.